SIRANE’S packaging supplies for farm-shops, fishmongers and butchers – all available from our new online shop – will be on show at the Farm-Shop and Deli Show 2019. We launched a new online store in late 2018 offering some of our more popular products including cooking bags, flower packaging and insulated bags – and samples of all the products will be on show on our stand, K71. Simon Balderson, Sirane managing director, said: “Sirane’s online store has filled a gap by allowing customers looking for smaller quantities to buy online. We have some great products for this sector, and now they can be bought at the click of a button, which will hopefully make it easier for farm-shops etc. “We’ve added products such as self-seal steam-cooking bags for the oven/microwave, which would be a great counter bag in butchers and farm-shops, oven/BBQ bags, and our popular thermally-insulated bag range. 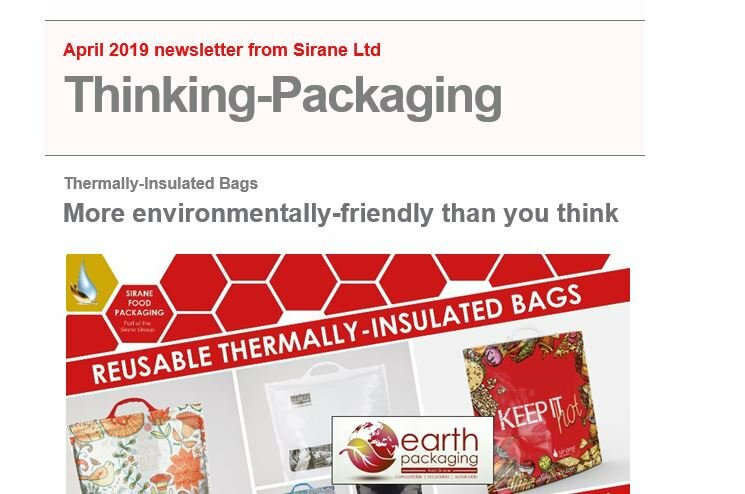 “We’re also adding our popular award-winning Earthpouch, a plastic-free packaging solution, which will be available as a stand-up pouch in three sizes. “If you’re looking for packaging for your over-the-counter sales which adds real value to your products, then it will be well worth paying a visit to our stand. Products are divided into four key areas: domestic/home use; food service including farm-shops, delis and catering; medical & healthcare, and horticultural. Mark Lingard, Marketing Manager, said: “This new online store is a result of a steady stream of inquiries from smaller customers looking to buy. Our minimum orders were always a problem, but this online store allows people to buy what they need, and we’re hoping that at the Farm-Show & Deli Show it will strike a chord. “Earthpouch is a plastic-free solution, a paper-based material with a plastic-free coating which is perfect for a range of products and could be the ideal packaging for some farm-shops and delicatessens. We’ve repeatedly been asked about supplying a plain pouch for smaller orders, and it will be available very soon. 2018 was a big year for the Earthpouch with some major industry recognition– it won a Green Apple Award, presented at the Houses of Parliament, and it also secured first place at the UK Packaging Awards in the Resource Efficient Pack of the Year category. The Earthpouch was also recognised at the Sustainable Food Awards in Amsterdam, where it finished third in the sustainable packaging category. One of the questions we’re often asked is ‘how do I fill the pouch?’ We’ve also recently added a pouch-filling line to our offering, the M7, which is compatible with the Earthpouch – and there will be a working machine on our stand. Simon Balderson added: “It’s a fast, versatile and low-cost option, with lines starting from just £35,000. Single and twin-head machines are available, and they are simple to operate. They also have a small footprint, so are perfect for this sector. There certainly might be companies supplying into farm-shops who will be interested. We’ll also have our Thinking-Cooking range on the stand: Thinking-Cooking offers many of the same products, including nylon roasting bags, BBQ bags etc as well as absorbent fat-trap grill liners, but packaged and branded for retail sale. The Farm Shop & Deli Show runs next week at the NEC, Birmingham, from April 8-10, 2019. Our stand at the show is K71 – close to the Farm Shop Live theatre. For more information on our shop, or to buy now, visit https://shop.sirane.com. No accounts are needed, and free delivery for commercial orders is from just £100.